Having an in-ground pool is a great way to kick back and enjoy the warmer months of the year. Should you decide to go with a heated pool, you can enjoy it for even longer. However, before you call a licensed contractor to begin work on your pool, there are a handful of things you need to know. 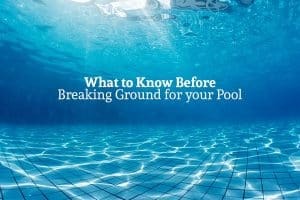 After all, the pool is both a major purchase and a major investment; so before breaking ground for your swimming pool, make sure you complete these steps so that the process goes smoothly. Texas 811 can help you locate your cable, electricity, and telephone lines. If any of these lines need to be rerouted (as is often the case), contact your service provider (such as Oncor or CenterPoint). They will let you know if any aerial cable options are available to you. If aerial cables are not an option, you’ll need to contact a licensed electrician to help you reroute the lines. Gas lines, sewer lines, and plumbing that need rerouting will need to be worked on by a licensed plumber. If you have a sprinkler system that needs rerouting, contact a licensed irrigation company. After any utility lines are adjusted and before breaking ground for your pool, you’ll need to apply for certain permits. If you have an HOA, they will likely require an application and pool design blueprint before allowing you to break ground on your property. Next are city permits, which can take 1-4 weeks to arrive. Some pool contractors will help you with this application process. Remember that your swimming pool builder must be licensed and/or registered for the city to grant you a permit. You likely know that the pool will come with maintenance costs for the years that you own it. However, in addition to permit and utility rerouting costs, there are other costs that you may not know about. Depending on your property, you may need to install an additional retaining wall, need specific landscaping performed, or need electrical walls or fences. There are different regulations you’ll need to follow if you’re going to have and keep your swimming pool, so keep in mind that the process will likely be more than simply having the pool placed in the ground. There are three different materials that pools can be made out of: fiberglass, concrete, and vinyl. Concrete can be used to construct a pool of nearly any size or shape. If there is a specific look or customizable feature you want for the swimming pool, concrete is the best option. It is slightly more expensive than the other two, but that is because it is a quality material that lasts longer. The two kinds of concrete are Shotcrete and gunite; the former is the better option because it is more resistant to cracks and other damage. It’s a good idea, therefore, to choose a pool builder who is experienced with Shotcrete pool installation. Fiberglass has its limitations in design options. It is a cheap option that is less durable than concrete, but more durable than vinyl. Vinyl is the cheapest option, and it is naturally smoother than concrete (although polished concrete is an option and looks great). Vinyl, however, is not as durable, nor does it prevent the growth of algae, so you’ll have to perform added maintenance on the pool. How Long Before the Pool is Ready? Sure, you want your swimming pool right now, but it will take a bit of time before it’s up and ready. The length of time you’ll need to wait has a few different variables, most of which are specific to your property (and the material you’ve decided to use). Rerouting utilities, permit applications, the design process, the time it takes for concrete to set, and other factors all add to the length of time between choosing to install a pool and actually getting to use it. At Summerhill Pools, we always make sure that you have the right pool for your particular needs. Before breaking ground, make sure to educate yourself on these preparations. Adding a swimming pool to your home is a major investment, so you need to know what you’re getting into before moving ahead. Once you know you’re ready to go, give the team at Summerhill Pools a call.